Nancy Sinatra senior, the first of Frank Sinatra's four wives and mother of his three children, has died aged 101. Her daughter Nancy Junior said that she had "passed away peacefully". "She was a blessing and the light of my life. Godspeed, Momma. Thank you for everything," she wrote. The couple quickly got engaged but Frank admitted having an affair before they eventually married in 1939. In 1950 Nancy Senior was granted a legal separation because of Frank's mental cruelty - she claimed the superstar went away for weekends by himself, and he had a string of extra marital affairs. However, the pair stayed close until Frank Sinatra's death in 1998, the New York Times reported. The couple had three children - Nancy Junior, who is famed for the song These Boots Were Made For Walkin' and other hits, Frank Junior, who also had a career in music and died in 2016 aged 72, and Tina. 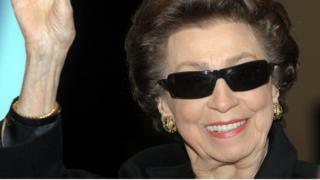 Frank Sinatra's fourth wife Barbara died last year aged 90.